Real English Conversations: What leads to success? Hi! Lori here, welcoming you to another episode of Real English Conversations from betteratenglish.com. In today’s conversation, my British friend Michael and I discuss our reactions to a presentation about “What leads to success,” given by Michael Richard St. John. Everyone wants to be successful, right? But have you ever wondered what it is that leads to success? Richard St. John spent several years interviewing hundreds of successful people, asking them about the factors that led to their success. In a three-minute presentation at the TED conference, he presented his findings, some of which you might find surprising. I highly suggest that you watch the video either before or after listening to this episode. I have embedded the video on our web site, www.betteratenglish.com. You can also find it on the TED web site, www.ted.com. By the way, the technical difficulties that I mentioned last week have supposedly been resolved now — please do let me know if you have any further problems downloading our audio files. Lori: I have a lot of business English students when I teach in the classroom and a lot of times we end up talking about things like success and what leads to success, and it’s interesting that many of them mention the element of luck. L: He doesn’t mention luck at all. M: Right, I’m a firm believer that people can make their own luck. I mean what people regard as being luck, you know, you can actually create to a degree. L: Right, right. I think a lot of what people consider luck is…is really…it’s down to how you respond to the opportunities that come your way. M: Yes, very good point, yeah. L: Seizing the opportunities. But was there any point in the video that you thought was particularly interesting? M: Umm…yes, actually there was. Something very close to my heart is a lot of people think in the same way that you say that these folks are saying they think that luck is important, that people think that innate talent is something that you have to have to be successful. And in the video that we saw, the point about getting good at something, and it’s not about…umm…having some innate talent, it’s all about practise, practise, practise. M: It’s hard work and that’s what you do, you know? L: …of course that’s going to help. But at the end of the day, you really do need to put your nose to the grindstone and do the work and get really, really good at what you do. L: Umm…I thought one of the interesting things in the video was the idea of passion being so important. M: Oh yeah, yeah definitely. L: And that people who really love what they do — of course you’re going to tend then to want to work harder and put the time and effort into it — and the funny thing is that if you love what you do and are really passionate about it and work really hard, the money kind of comes automatically. M: Well, yeah I…I think with that point as well is that if you really love what you’re doing, then hard work doesn’t actually seem like hard work. L: No, that’s another point he takes up that it could actually, you know, that that the people he interviews — all of these 500 successful people — that they do work very hard but that they have fun while they’re working. L: Yeah, and another thing that I thought was important was the idea that you have to push yourself through all kinds of setbacks and hard times. L: You will never succeed. M: I’m sure in a lot of cases, people who’ve been successful, it’s not the first idea that they had or it’s not the first person that they brought it to that took them on and financed them or helped them, you know? I mean, how many venture capitalists said no before, you know, umm, finally one said yes? L: Yeah I’m sure that there’s a lot in that…that a lot of successful businesses have pushed through setbacks and hard times and just not given up. M: Yeah, it’s not like you succeed and — I mean, sure, maybe some people succeed first time — but I don’t think that’s very common. L: Exactly…umm…yeah. And then another thing that I thought was really interesting was the idea of having to focus. L: Yeah, and there’s the idea of being a jack-of-all-trades, master of none! L: You know, trying to be too good at too many things; it’s never going to work, It’s better to pick the thing that you really are passionate about and that you really, really want to devote yourself to. M: Yeah, that was a good one, yeah. L: Yeah and…and just push. So I thought that was really interesting…umm. M: Nice and positive as well. L: Yeah, I really love…it’s a fan-…don’t you think it’s a great presentation? M: …the positive message, because the idea about luck and innate talent is a bit disheartening to people because you have…there’s nothing much you can do about those things. L: …by that. But I think his slides are really great too; you know you don’t see…I mean there are some bullet points, but it’s not heavy. There’s not too many words on the slides and he’s got nice images and it’s…it’s just a really tight, interesting and funny presentation as well. L: Yeah, yeah I hope so! L: And I hope that the…the video, if they do watch it that it will inspire them as much as it inspired me. That’s all for today. If you found today’s topic interesting, we’d love to hear your comments. You can leave a comment at our web site, www.betteratenglish.com, or e-mail us at info AT betteratenglish DOT com. And remember, your continued donations make our shows possible. Bye for now! If X is down to Y, then X is the main reason for Y, or the main thing that is important for doing Y. If something is close to your heart, it means that it is very important to you. If something is innate, it is something you were born with, not something you learned. To be predisposed to/towards something means that you are likely to behave in a particular way or to exhibit certain characteristics. The idiom to put one’s nose to the grindstone means that you work very hard for a long time. A setback is something that causes delays in success or prevents you from making progress. The idiom a smooth ride means having an easy, trouble-free time doing something. The opposite is a bumpy ride, which means facing lots of difficulties and problems. Venture capitalists help start-up companies by investing money in them. If you give up, you stop trying. A jack-of-all-trades is someone who can do many different jobs. In this context, heavy means tedious and boring. In presentation software such as Powerpoint, each “page” is called a slide. If you describe a talk or presentation as tight, it means that it was concise and well constructed, with no unneeded parts or excess. • See the original video and many other great presentations on the TED website. 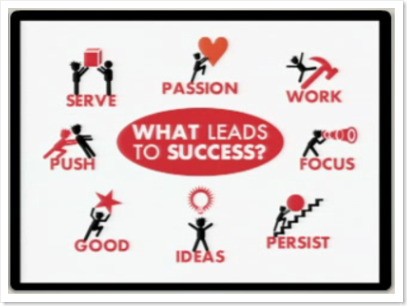 • Richard St. John’s webpage about success, and another video presentation. • You can even buy his book about success on Amazon. This entry was posted in Listening, podcast, Real English conversations, Upper intermediate by Lori.